4025 1957 Laser Hot Hits. Tony Carey "Fine Fine Day," Princessa "Snowflakes." SINPO 54444. 6210 1730 Radio Onda Caliente. Siouxsie & The Banshees song, ID. SINPO 34333. 6220 1648 Radio Ronalisa. Aqua "Barbie Girl," settled here after utility QRM on 6300 & 6240. SINPO 34333. 6280 1625 Radio Merlin Int. "World Without Love," ID, "I Believe," some utility QRM. SINPO 33333. 6290 1737 Radio Rode Adelaar. Dutch songs. SINPO 54444. 6290 1922 Telstar Radio & Hitmix Radio. Closing down, polka. SINPO 44333. 6292 1655 Radio Python. "Monster Mash," SINPO 44333. 6305 1643 Radio Merlin Int. Moved from 6280. "The Crying Game," SINPO 34333. 6747 1634 Radio Pioneer. "Golden Boy," and "My Love." SINPO 44333. 6935 1931 Free Radio Victoria. ID, Mike Oldfield. SINPO 34333. 8100 1945 Greek pirate. Harmonic from medium wave (1620x5). Greek folk music. SINPO 34333. Also much weaker 4th harmonic on 6480. The Radio Caroline North RSL was relayed on shortwave by Radio Merlin which sent out this QSL. 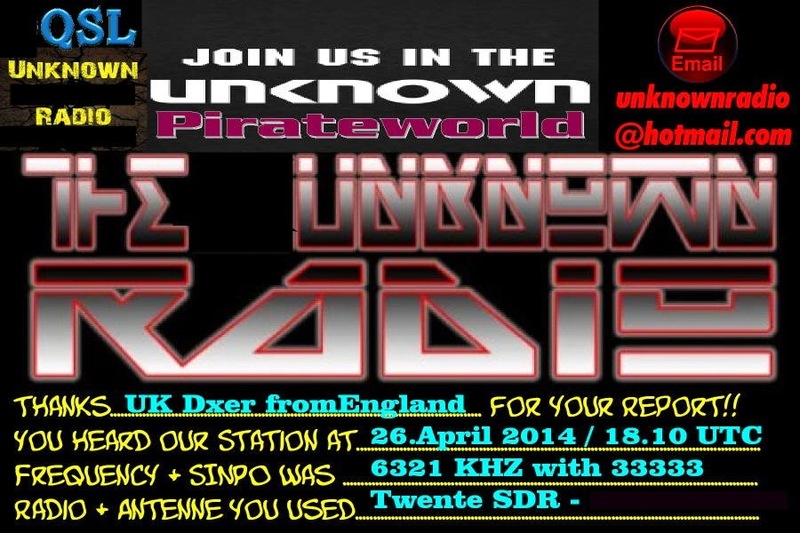 The QSL below came from Unknown Radio, who I suspect is a well-known pirate. Thanks for the QSLs. 4025 2030 Laser Hot Hits. Jefferson Starship, then "Watching The Stars." SINPO 54444. 6940 2003 Little Feat Radio. "Let's Dance," "One Fine Day," ID. SINPO 34333. 14561v 2015 Eldorado Radio from Portugal. Techno music. SINPO 34333. 6305 2125 Laser Hot Hits. Recordings from Caroline 819 from 1980s. SINPO 54444. 6220 2057 Radio Tango Italia. Tango mx. SINPO 34333. 6241 2044 Radio Underground. Santana, strong but utility QRM. SINPO 53443. 6255 2048 Radio Telstar South. "Rule Britannia," talk about Britain Radio, ute QRM. SINPO 53443. 6285 2052 Radio Focus Int. John Denver "Annie's Song," SINPO 54444. 6305 2100 Radio Merlin Int. Relay of Radio Caroline North, splash from 6310. SINPO 33333. 6310 2055 Delta Radio. Rock mx, some SSB QRM. SINPO 43333. 6910 2040 Premier Radio Int. "The Only I Love," ID 'broadcasting live from west coast of Ireland.' SINPO 34333. 4025 1715 Laser Hot Hits. Dance mx. SINPO 34333. 6205 0910 Radio King SW. Prog rock. SINPO 34333. 6210 1350 Radio Waves Int. Country mx. SINPO 24332. 6215 1641 Radio Mustang. Soft rock. SINPO 54444. 6220 1345 Hitmix Radio. Schlager. SINPO 34333. 6220 1720 Radio Flying Dutchman. Greetings, "Knock on Wood," over-modulated. SINPO 44433. 6240 1613 Radio Experience. Salsa music, testing new transmitter. SINPO 44433. 6250 1630 Radio Golfbreker. Polka. SINPO 44333. 6268 1705 Radio Titanic. "Summer Train." SINPO 44433. 6285 0900 Radio Focus Int. Alison Moyet "All Cried Out," ID. SINPO 44433. 6292 1255 Barracuda Radio. Dance mx, moved to 6295 at 1315. SINPO 44433. 6292 1618 Radio Rode Adelaar. "Lonesome Me," "Country Roads," ID, email. SINPO 54444. 6305 1320 Radio Odynn. Move from 6323. Dutch songs. SINPO 34333. 6321 1810 Unknown Radio. Email add, "Ring of Fire," utility QRM. SINPO 33333. 6323 1305 Radio Odynn. Greetings, ID, Dutch music. SINPO 34333. 6324 1554 Radio Underground. QSO with Radio Rob. SINPO 44433. 6324 1556 Radio Rob. QSO, talk about making video. SINPO 34333. 6449 1927 Radio Lowland. "Relight My Fire," SINPO 44333. 6725 1601 Radio Tower. Dutch version of "Ring of Fire," polka. SINPO 54444. 6747 1608 Radio Pioneer. Doobie Bros "Listen to the Music." SINPO 44433. 6808 1646 Sundown Radio. "California Girls," ID/email jingle. SINPO 44433. 6939 1652 Little Feat Radio. Oldies, ID, off. SINPO 34333. 4025 2012 Laser Hot Hits. Four Tops "Baby I Need Your Loving," then The Troggs. SINPO 54444. 6205 2022 Sluwe Vos Radio. ID, greetings, oldies. SINPO 54444. 6220 2026 Radio Ronalisa. "Una Paloma Blanca." SINPO 34333. 6241 2028 Radio Underground. Greetings, Kraftwerk "Autobahn," utility QRM. SINPO 53443. 6265 2003 Radio Tango Italia. Tango mx, SSB QRM. SINPO 33333. 6285 1957 Radio Focus Int. Eli Bonarparte song from 1970 then Rolling Stones live. SINPO 54444. 6295 1940 Radio Mustang. Boney M "Ma Baker," ID, greets, very strong. SINPO 55444. 6375 1947 Radio Python. Having equipment problems, electro mx. SINPO 44333. 6450 1957 Studio 52. Status Quo. SINPO 44433. 6747 1943 Radio Pioneer. CCR "Have You Ever Seen the Rain," SINPO 54444. 3935 1948 Radio Rainbow. Rolling Stones "Start Me Up." SINPO 24332. 4025 2004 Laser Hot Hits. Ian Lawrence show. Barry White "Trouble With Me." SINPO 54444. 6212 2036 Radio Minipower (tent). Oldies. SINPO 34333. 6260 2028 Radio Mazda. Dutch song, then "Needles & Pins." SINPO 54444. 6205 1710 Radio Sun City. "Some Gets In Your Eyes," "Without You." SSB QRM. Occasional IDs. SINPO 33333. 6290 1639 Radio Silverback. Dutch songs. SINPO 44333. 4025 2025 Laser Hot Hits. Bananarama "Love Truth & Honesty." SINPO 54444. 6212 2022 Radio Minipower. Kool & The Gang "Get Down On It." SINPO 34333. 6219 2012 Radio Star Int. Tim Anderson programme ending, then off air. SINPO 44433. 6239 2010 Radio Marabu. ID, alternative music. SINPO 54444. 6280 2018 Radio Merlin Int. ID, Leftfield. SINPO 34333. 6293 2005 Radio Underground. Jimi Hendrix, greetings. SINPO 54444. 6383 2000 Radio Little Feat. Disco mx, ID. SINPO 34333. 3905 2213 Radio Alice. Inst version of "Let it Be," ID jingle. SINPO 44333. 4025 1622 Laser Hot Hits. Bryan Adams "Run to You." SINPO 34333. 6045 0843 European Music Radio via Nauen. Jermaine Stewart "We Don't Have to Take Our Clothes Off." Also on 9485. SINPO 55555. 6200 0832 Radio Technical Man. Dutch songs, ID, said closing soon. SINPO 54444. 6219 0855 Radio Star Int. Matt Roberts talking about Dutch pirates, North Korea, song by The Crimea. SINPO 34333. 6239 0825 Radio Marabu. Alternative music, signal slightly overmodulated. SINPO 44333. 6250 0852 Radio Casanova. Country music. SINPO 44433. 6255 2203 Radio Telstar South. Sixties music. SINPO 43433. 6265 0804 Radio Nora. ID, ZZ Top. SINPO 44433. 6265 2155 Radio Tango Italia. Tango mx. SINPO 44333. 6280 0809 Radio Merlin Int. Supertramp "Goodbye Stranger." SINPO 34333. 6283 2158 Radio Python. Killers "Mr Brightside", spelling out name. SINPO 54444. 6285 0840 Radio Mazda. Dutch songs. SINPO 54444. 6285 1040 The Ghoul. Strawberry Switchblade "Only Yesterday." SINPO 44433. 6290 0815 Radio Orang Utan. Signing off. SINPO 34333. 6291 2209 Radio Pirana Int. Latin American music, "Ghostbusters." SINPO 34333. 6324 2156 Radio Underground. "Oxygene", closing down, greeeting Terry in Newfoundland. SINPO 44433. 6325 0820 Radio Norton. Dutch songs. SINPO 44433. 6481 1050 Skylab Radio. Music, ID. Weak. SINPO 24332. 6725 1615 Radio Tower. "Soldiers Who Want to be Heroes." SINPO 54444. 6803 0913 Radio Pink Panther. "Can't Get Enough of Your Love." SINPO 44433. 7300 0905 U Boat 66 Radio. Bruce Hornsby "The Way It Is." SINPO 343333. 7328 0945 Radio Mistero Ghost Planet. Music, weak signal. SINPO 24332. 7475 0953 Trans Europe Radio. Modern Talking "Brother Louie" SINPO 44333. 9485 0846 EMR v Gohren. "Echo Beach," also on 6045. SINPO 34333. 9485 0925 Radio Geronimo SW via Gohren. Dave Scott show. Brimstone "The Fixed Wheel," reading reception reports. SINPO 55444. 3905 1813 Radio Calypso. Dutch song. SINPO 34333. 3936 2242 Crazy Wave Radio. Heart "Alone," SINPO 34333. 4025 1745 Laser Hot Hits. Go West "We Close Our Eyes." SINPO 44433. 6205 0845 Radio King Shortwave. Sparks "Amateur Hour." SINPO 34333. 6210 1718 Radio Technical Man. ID, "Runaway Train." SINPO 54444. 6219 0832 Radio Star Int. Station announcement, Rush "Spirit of Radio." SINPO 44333. 6239 0825 Radio Marabu. Alternative mx. SINPO 44433. 6255 1906 Radio Merlin Int. Tremeloes, then Rolling Stones. SINPO 33333. 6268 1807 Cosmic Radio. Oldies. SINPO 34333. 6283 1711 Hit Mix Radio. "More more More" then "Lonely Boy." SINPO 44433. 6285 2216 Cupid Radio. ID, dance mx, QSO Powerliner. SINPO 54444. 6285 2230 Radio Powerliner. Polka, QSO Cupid. SINPO 34333. 6290 0840 Radio Verona. Dutch music. SINPO 44433. 6306 1913 Radio Mustang. "Walking on Sunshine," move to 6325. SINPO 55444. 6325 1817 Radio Telstar. Relay of Artem's World Music Show. SINPO 54444. 6325 1915 Radio Mustang. Move from 6306. "Chariots of Fire." SINPO 54444. 6378 1928 Radio Minipower. Blues music. SINPO 34333. 6380 2212 Radio Zeewolf. Sweet "Fox on the Run", ID, AC DC. SINPO 44333. 6425 1705 Radio Zeewolf. "Give Me A Redneck Girl," Visage "Fade to Grey." SINPO 44433. 6450 1901 Studio 52. ID, inst mx. SINPO 44333. 6808 1726 Sundown Radio. ID, oldies. SINPO 44433. 6910 1735 Premier Radio. Caroline recordings, ID, "Out of Time." SINPO 34333. 6925L 1855 Over 60 Degree Radio. BZN music. SINPO 34433. 6945 2205 Radio Minipower. Diana Ross "Love Hangover." SINPO 34333. 9510 0855 Radio City v IRRS. "This Old House," sign off. SINPO 55544. 3905 1925 Skyline International Radio. Dutch songs. SINPO 54444. 4026 1928 Laser Hot Hits. Anorak Hour with Radio Caroline air checks from 1980s. SINPO 54444. 6219 1915 Radio Star Int. Petula Clark "Call Me," ID, better signal than last week. SINPO 54444. 6255 1910 Radio Telstar South. Frank Ifield "I Remember You," utility QRM. SINPO 53433. 6265 1920 Radio Tango Italia. Tango music. SINPO 44333. 6286 1905 Radio Underground. Visage "Fade to Grey," greetings. SINPO 54444. 6383 1900 NMD Radio. "Railroad Man," strong peaks. SINPO 44333. A suspected pirate radio station operating from the centre of Taunton, Somerset, has been closed down following a raid by police and OFCOM officers. Town Centre Neighbourhood officers and members of OFCOM, the independent regulator and competition authority for the UK communications industries, executed a warrant under the Wireless and Telegraphy Act 2006. Computers and broadcasting equipment was seized during the operation in the High Street area, police say. Police were called in after complaints about Rage FM, which broadcast junk music and political comment, including expletives. Comments on the BDXC group said the station was also raided in 2012. This QSL was received in the post for an email report sent in January. 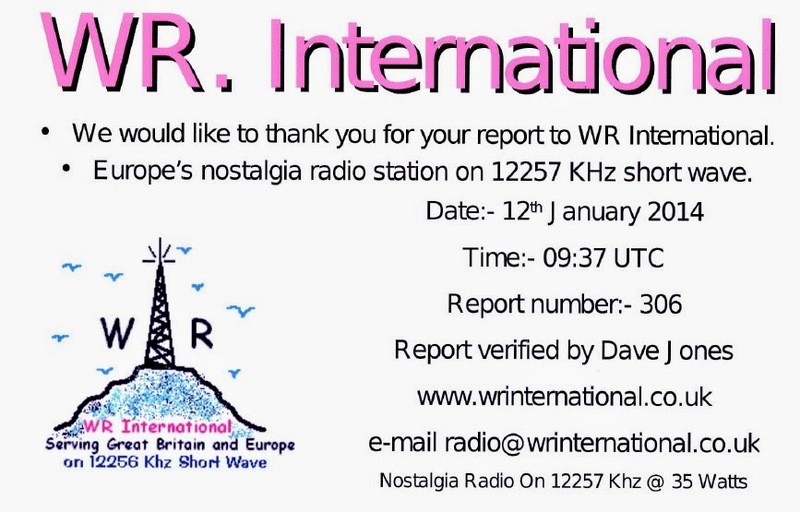 WR International is a difficult catch in the UK due to its high frequency but was heard quite well on the Twente SDR receiver in The Netherlands. In addition to the QSL card, I received a WRI pen and calendar plus a personal letter. The station has been on the air for 20 years, has a power output of 35 watts fed into a wire dipole antenna and broadcasts live every Sunday morning from 0800-1100 UTC on 12257 kHz. 4025 2019 Laser Hot Hits. Talk about Horizon FM, Jimmy Somerville "Heartbeats." SINPO 54444. 6280 2000 Old Time Radio. Schlager, announced address in Munich. SINPO 54444. 6290 2012 Radio Minipower. Pops. SINPO 343333. Easter, Friday April 18th at 18 - 19 GMT on 7290 and 1368 kHz, with a repeat on Saturday April 19th at 08 - 09 GMT on 9510 kHz. As usual there is a weekly transmission every Saturday evening via Radio Merkurs, Riga, Latvia on 1485 kHz at 19 - 20 GMT. The transmission via Hamburger Lokalradio is next Saturday, April 26th at 12 - 13 GMT on 7265 kHz. 4025 1955 Laser Hot Hits. Suzanne Vega song. SINPO 54444. 6214 1935 Radio Minipower. New Italian station. "What A Fool Believes," then Chic "I Want Your Love." SINPO 34333. 4025 1857 Laser Hot Hits. Recordings of Radio Caroline. SINPO 44433. 6280 1907 Radio Merlin Int. Blues mx. SINPO 34333. 3905 1853 Radio Activity. "Man of Action," ID. SINPO 34333. 4025 1716 Laser Hot Hits. New frequency. Supertramp "Take the Long Way Home." SINPO 34333. 6200 1239 Radio Rode Adelaar. ID, Dutch mx and closedown. SINPO 44333. 6219 1254 Radio Star Int. Matt Roberts programme. Alternative mx, ID/email. SINPO 24332. 6235 1806 Horizon FM. "I Don't Care," then Eurythmics "Sweet Dreams." SINPO 44433. 6242 1803 Radio Onda Caliente. Move from 6265. Signing off. SINPO 44333. 6265 1732 Radio Onda Caliente. Move from 6212. IDs, instr music. SINPO 34333. 6285 1617 Mustang Radio. ID, greetings, "Swamp Thing," "Red Red Wine." SINPO 54444. 6285 1708 Radio Altrex. Dance music. SINPO 34333. 6297 1627 Radio Telstar. Sigue Sigue Sputnik "Love Missile," Human League "Don't You Want Me." SINPO 54444. 6297 1749 Countdown Radio. UB40 "Baby Come Back" then Coldplay, some utility splash. SINPO 53443. 6316 1620 Radio Sallandse Boer. ID, "Born to Make Me Happy." SINPO 43433. 6320 1622 Trans Europe Radio. Adam & The Ants "Stand & Deliver," then Human League "Keep Feeling Fascination." SINPO 44433. 6385 1857 Radio Universe. Hall & Oates "Maneater." SINPO 54444. 6808 1743 Sundown Radio. ID jingles, "Locomotion." SINPO 44444. 6950 1315 Radio Pluto. Mike Oldfield song, only using 3W. SINPO 24332. 6978 1826 Rock Radio Network. Rock music, occasional IDs. SINPO 54444. 7595 1328 Trans Europe Radio. Louis Armstrong "What A Wonderful World," ID/email. SINPO 44433. Radio Spaceshuttle taking part in Pirate Contest! 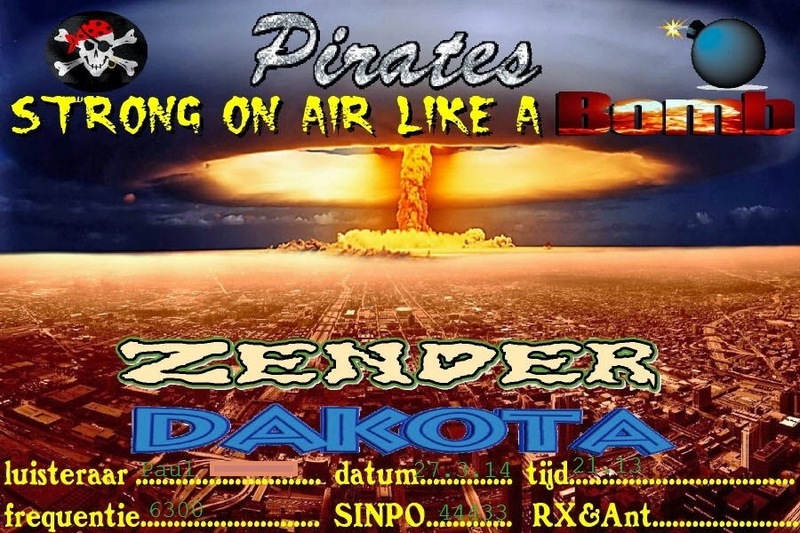 And Special Pirate Contest/ Last Radio Spaceshuttle transmission QSL have been designed and is available for everyone sending correct reception reports from our tx. 4029 1917 Laser Hot Hits. Blondie "Sunday Girl" then Roxy Music "Love is the Drug." SINPO 54444. 6210 1902 Radio Relmus. ID jingle, The Cure "A Forest," then The Doors. SINPO 54444. 6280 1858 Cosmic Radio. Boston "More than A Feeling." SINPO 34333. 6286 1906 Radio Tango Italia. ID jingles, tango mx. SINPO 34333. 6295 1910 Radio Python. Rock music. SINPO 54444. 6300 1855 Radio Dakota. Dutch mx, bad ute QRM. SINPO 42432. 6747 1850 Radio Pioneer. "Save the Last Dance for Me." SINPO 54444. 11403L 1948 Over 60 Degree Radio. "Love is All," then Frankie Goes to Hollywood "Relax." SINPO 34433. 4029 1950 Laser Hot Hits. Radio Caroline recordings. SINPO 54444. 6210 1935 Sluwe Vos Radio. Move from 6215. Pet Shop Boys "Rent." SINPO 54444. 6215 1853 Sluwe Vos Radio. New Order "Blue Monday," ID, greetings. SINPO 54444. 6280 1850 Radio Merlin. King Crimson. SINPO 44333. 6290 1858 Radio Mazda. Bryan Adams "Run to You." SINPO 54444. 6940 1845 Radio Coax. Oldies. Weak. SINPO 24332. 6240 1724 Radio AC DC. Move from 6250 where bad QRM. Greetings, "Rawhide", AC DC "Highway to Hell." SINPO 44444. 6270 1732 Cosmic Radio. Songs from Morrissey, Kasasbian, The Clash. SINPO 24332. 6285 1630 Radio Experience. "Singing in the Rain," then Fleetwood Mac song. SINPO 44433. 6295 1635 Radio Rode Adelaar. Polka, strong peaks. SINPO 44444. 4029 1915 Laser Hot Hits. Suzanne Vega song, then a song "This Side of Heaven." SINPO 44433. 6210 1925 Shortwave Gold. ID jingle, oldies. SINPO 34333. 6425 1931 Radio Ronalisa. Testing with just 2W. "YMCA" then "Mull of Kintyre." Weak-fair. SINPO 24332. RSI's next Broadcast will commence on Saturday 12th April 2014. We will be broadcasting Somewhere on 48m Shortwave. Presenters Roger Dale, Tim Anderson, Matt Roberts, Peter Verbruggen, Christopher Phillips and the Spotlight Kid will be heard over the 8 hours and we hope you can tune in and make contact with us with your reports. All reports will be verified with an E-QSL. 4026 1906 Laser Hot Hits. Status Quo "Sweet Caroline," then Rainbow "Since You've Been Gone." SINPO 54444. 6210 1920 Shortwave Gold. ID jingle, Gibson Brothers "Cuba". SINPO 34333. 6240 1900 Radio Casanova. Dutch song, ID/email and off. SINPO 54444. 6285 1914 Radio Kleinezender. Dutch mx. SINPO 24332. 4029 1520 Laser Hot Hits. Leo Sayer "Moonlighting." SINPO 34333. 6205 0855 Horizon FM. Pop. SINPO 34333. 6210 1700 Vasily's Weekend Show (via relay). Live from Moscow, welcoming listeners, David Bowie "Let's Dance." SINPO 54444. 6245 0849 Radio Casanova. Dutch songs, ID, greetings. SINPO 54444. 6250 0810 Radio AC DC. "Didn't I Hear You Crying," "Rawhide," ID, greetings. SINPO 44433. 6250 1055 Radio Groenteboertje. "Another Brick in the Wall," "Rock Around the Clock." SINPO 55444. 6270 0828 Radio Mazda. Dutch songs. SINPO 54444. On 6274 at 0858 (54444). 6285 1505 Radio Nightpirate & Radio Ronex. QSO. Both SINPO 44433. 6285 1548 Radio Barones. Thin Lizzy "Boys are Back in Town," ID, greetings, also on 1611. Not sure if a relay or direct. SINPO 44433. 6288 0805 Radio Altrex. Dutch song, cow moos SINPO 34333. 6299 1500 Magic AM. Duran Duran "Ordinary World," said closing down, carrier from station warming on 6300. SINPO 53433. 6300 0819 Radio Paardenkracht. "She's In Love With You." SINPO 54444. 6325 1003 Radio Norton. Brass band music. SINPO 34333. 6394 1100 Radio Baken 16. Instrumental mx, jingle "I'm A Train." SINPO 44333. 6395 1535 Big Dutch QSO. Many stations having Sunday afternoon chat, including Zeewolf, Pluto, Baken 16, Akai, Rob & VOTN. 6803 1135 Pink Panther Radio. ID and talk in Dutch and English, Mud "Tiger Feet." SINPO 44433. 6910 0834 Premier Radio Int. Spandau Ballet "True," ID, greetings, Kylie "I Should Be So Lucky." SINPO 34333. 7300 0900 U Boat 66 Radio. Oldies, greetings. SINPO 34333. 7330 1035 Radio Joystick v Moostrum. "Going to Give You My Love," Charlie Prince talk in German. SINPO 55555. 7375 1020 Unid. Offshore radio jingles & documentaries. SINPO 34333. 7490 1120 Trans Europe Radio. Ultravox "Vienna." SINPO 34333. 11401 0840 Radio Waves Int. Country music. SINPO 44433. 12257 0845 WR International. Oldies, signal suffering some form of utility interference. SINPO 23432. 15730 1008 Radio Black Arrow. T Rex "20th Century Boy," then "Bette Davis Eyes." Surprisingly, fair signal. SINPO 34333. 5805 1727 Radio Joey. Talk Talk "It's A Shame." SINPO 44433. 6205 0826 Radio King Shortwave. Oldies. Co-channel with another station (Horizon?). SINPO 42432. 6205 1722 Horizon FM. Coldplay song. SINPO 34333. 6215 1717 Carmen Radio. "Bang Bang," strong peaks. SINPO 44433. 6265 1732 Radio Tango Italia. Usual tango mx. SINPO 33333. 6281 1442 Radio Caroline North (via relay). Thomas Lang "Happy Man," then "Ghost in My House." SINPO 24332. 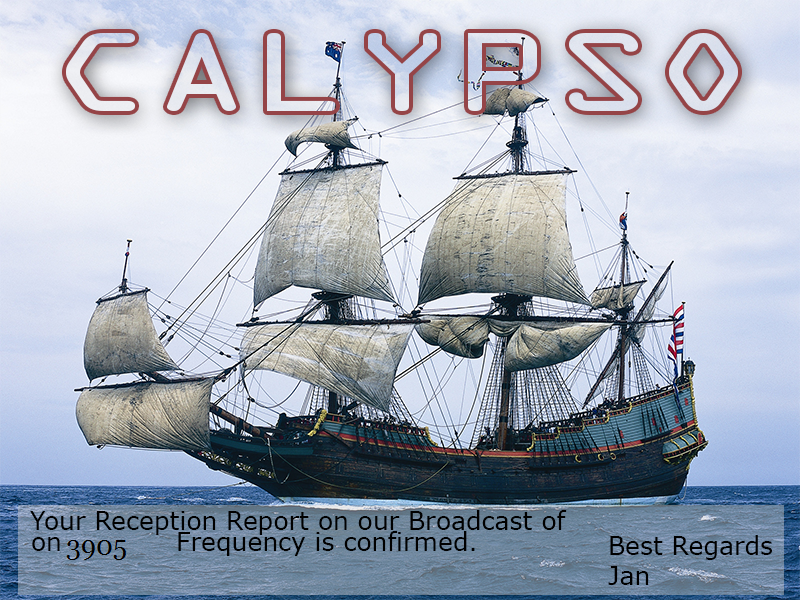 6290 1415 Radio Calypso. Country mx, ID, greetings. SINPO 44433. 6323 1710 Radio Altrex. Dance mx, ID, greetings, utility splash. SINPO 43333. 6485 1736 Premier Radio Int. ID/email address, Rennaissance "Northern Lights", utility QRM. SINPO 43433. 6935 0812 Little Feat Radio. "Stay A Little Bit Longer," short test. SINPO 34333. 6747 1426 Radio Pioneer. Jean Michel Jarre. SINPO 44433. 6955 0805 Radio Coax. Oldies. Weak signal. SINPO 24332. 3905 1925 Skyline International Radio. 10cc "Little Donna," then schlager. SINPO 54444. 4029 1945 Laser Hot Hits. Beverly Knight, then Eagles "Journey of the Sorcerer." SINPO 54444. 6205 1914 Horizon FM. Beyonce then Adele songs. SINPO 44433. 6210 1920 Shortwave Gold. ID/email jingle, oldies, splash from Horizon. SINPO 33333. 6285 2000 LHH via Radio Blackbeard. Dance mx. SINPO 44333. 6305 1905 Radio Mustang. Simple Minds "Belfast Child." SINPO 54444. 6330 1932 Radio Zodiac. Oldies. Strong signal but bad ute QRM. SINPO 53433. 6210 1656 Shortwave Gold. Yello "The Race," ID jingle, "Going Back to My Roots." SINPO 34333. 6285 1747 Hit Mix Radio. Move from 6295. Rolling Stones "Start Me Up." SINPO 44433. 6295 1642 Hit Mix Radio. Abba "SOS" and "Fernando." SINPO 44333. 6320 1710 Radio Altrex. Oldies. SINPO 34333. 6950 1735 Radio Blackbeard. Dance mx, occasional utility QRM, audio better. SINPO 43333. 4029 1721 Laser Hot Hits. Reading report from Italy, Roy Orbison "You Got It." SINPO 44433. 6205 1715 Horizon FM. Pop music. SINPO 34333. 6210 1640 Shortwave Gold. Soul music, ID jingles, fair peaks. SINPO 24332. 6273 1652 Radio Black Arrow. Move from 6282, greetings, closedown. SINPO 54444. Back on 6275 at 1745. SINPO 54444. 6282 1645 Radio Black Arrow. "Poison" Alice Cooper," talk in Dutch. SINPO 54444. 6289 1654 Radio Experience. "Runaway Train," "Rhythm is a Dancer." Good peaks. SINPO 34333. 6295 1749 Radio Blackbeard. "Give Me Your Love," "Papas Got A Brand New Pigbag." SINPO 44433. 6305 1615 Radio Akai. Talk in Dutch, close down, utility splash. SINPO 43433. 6320 2035 Radio Tidalwave. Level 42 "Lessons in Love," ID jingle, summer meeting promo. SINPO 54444. A couple of Dutch QSLs received this week for recent reception reports. Thanks! 4029 1935 Laser Hot Hits. Dance mx. SINPO 54444. 6205 1930 Horizon FM. Ellie Goulding "How Long Will I Love You," weather forecast, then Jessie J. SINPO 34333. 6210 1900 Radio Borderhunter. "Needles & Pins" and other 60s music. SINPO 54444. 6280 1923 Radio Caroline North (relay of RSL). "Standy By Me," ID jingle. SINPO 34333. 6425 1909 Radio Nostalgie. Greek music, then Carpenters "Please Mr Postman." SINPO 34333. 6735 1913 Cool AM. Wild Cherry "Play That Funky Music." SINPO 34333.